He has performed hajj; written a song celebrating the election of the first black president; been arrested protesting with Occupy Homes; is a proud student of the late Imam Warith Deen Mohammed; and performed one of the most politically incendiary critiques of America’s complicated race legacy on a late night talk show in recent television memory. His lyrics are filled with deeply personal and autobiographical meditations of a White-American Muslim albino navigating the travails of race and marriage, and the struggles of everyday people. To some he is a contradiction, but to many of us he exemplifies what we love most about a particular truth-telling spirit and aesthetic in hip-hop, even as that spirit often gets tragically eclipsed or comprised by the overwhelming commercializing forces in the music industry. As part of the recognition and attention he is getting for his latest album, Brother Ali was interviewed by Dr. Cornel West for the Smiley and West show. Listen here. Yet, Brother Ali’s connection to this tradition speaks to one of the most remarkable and still under-reported aspects of the American Muslim legacy over the last 40 years: the emergence of a truth-telling spirit, aesthetic and expression within hip-hop, championed over the years by artists who either broadly self-identify as Muslim, or whose sensibilities have been deeply informed and widely influenced by an organic encounter with Islam. From Rakim in the pioneering 80s, to Mos Def in the globalizing 90s, to Lupe Fiasco in the new millennium, some of hip-hop’s most celebrated and accomplished artists come out of this experience. Brother Ali speaks of and celebrates this legacy often. I first met with him in a restaurant in downtown Minneapolis with hopes of securing him for our 2005 Takin’ It to the Streets. We had a passionate conversation–the only kind you can have with this man–and he graciously agreed. Brother Ali would go on to appear at a number of IMAN events over the years and most recently performed at IMAN’s 15th Anniversary Takin’ it to the Streets, in 2013. The tension of honestly exploring the spectrum of raw emotions and experiences that makes well-crafted art truly transcendent, while remaining rooted in spiritual values that don’t degrade the substance of its expression, are among the conversations we continue to have. That’s a large issue and the type of topic that can be debated for hours and if you were to have peeked in at IMAN’s 2011 Artist Retreat around dawn, you would have found Brother Ali energetically leading a seriously sleep-deprived congregation of fellow artists and activists for an animated post-Fajr reflection on such themes. One thing that is less debatable is the fact that Brother Ali remains one of the realest and rawest talents in the industry, and attending a Brother Ali show is about as close as many in his audience will ever get to engaging and embracing an unapologetically universal expression of Islam’s emphasis on love, justice, mercy and empathy for our fellow human beings. On behalf of IMAN’s staff, leaders, and board of directors, we want to thank the IMAN community in Chicago and across the country for helping us to meet and exceed our 2014 Ramadan Drive goal! We witnessed an outpouring of prayers and support from hundreds of people this month, from Virginia to California, Naperville to Marquette Park, and we are humbled and grateful for every dollar given and every du’a made. Part of what makes IMAN supporters unique is that they understand not only that they contribute their funds to this organization, but that they serve and are served by IMAN’s work. They recognize their investment in a model that has the ability to transform both the inner-city communities and themselves. Whether it’s passing out free fruit smoothies in front of Muslim owned corner stores, digging holes for our community garden, teaching local high school students how to use video editing software, planning a family arts festival in the park, or prescribing blood pressure medication to under-insured patients, the people who give to this organization are not only donors but leaders without whom none of this work would be possible. We cannot thank you enough for your commitment to this effort. We understand and appreciate, deeply, the fact that your hard-earned dollars and heartfelt prayers could go elsewhere every year, and we do not underestimate the great amana—sacred trust—that your contributions are to us. Our supporters across the globe are the mainstay of this organization and we pray that the Most High continues to bless and protect your families and to make us worthy of your support. During the month of Ramadan, IMAN’s staff and leaders are not only in a heightened state of reflection and fasting, but they are also very busy with our Muslim Run Campaign for Health, Wellness and Healing. 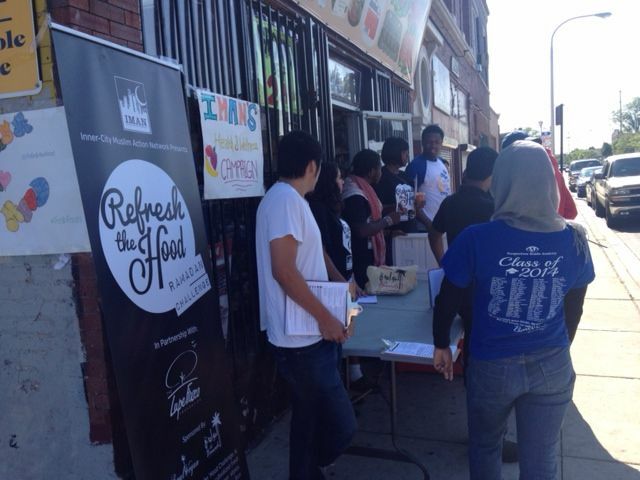 Every Ramadan, IMAN uses “Refresh the ‘Hood” as a campaign strategy to (1) engage residents around healthy living, (2) provide neighborhood corner stores with fresh organic produce, (3) heal the tensions between store owners and community residents, and (4) get residents involved with the campaign. This Ramadan, we were planted in front of two partner stores—Mali Mart and A Lot To Save Foods—on Tuesdays and Thursdays for three weeks. We were successful in signing up residents to get involved specifically with the Muslim Run campaign, giving out over 500 smoothies, and selling fruit at a discounted rate. Our youth leaders were instrumental in conducting surveys and ushering residents into the store to see the healthy display of produce, while steering committee leaders were working with storeowners on store layout. This year’s “Refresh the ‘Hood” allowed IMAN to get closer to the Muslim Run Campaign’s goal of an overall revamping of our partner stores, including making structural and aesthetic changes in the stores, strengthening our store committees for each store and beginning to spread our impact inside of schools in Englewood and Chicago Lawn around healthy lifestyles. Many thanks to our partners Lupe Fiasco Foundation and Al Bawadi Grill for providing the fresh produce and smoothies to help advance our Muslim Run efforts this Ramadan. Yusef Lateef was perhaps one of Detroit’s and America’s most legendary Jazz artists. Lateef, who passed away last December, was one of the most prominent American Muslim artists who profoundly transformed this uniquely American cultural expression. In recognition of this artistic giant and the city that he loved so much, IMAN is devoting the theme of our special Detroit CommUNITY Café—on Friday, August 29—to this legend and to this beautiful attribute of the Divine. Al Lateef translates as The Most Gentle and is one of the names of the Divine. For decades, Jazz lovers around the world heard Yusef Lateef channel the healing power of music through his phenomenal and distinctive artistic genius. 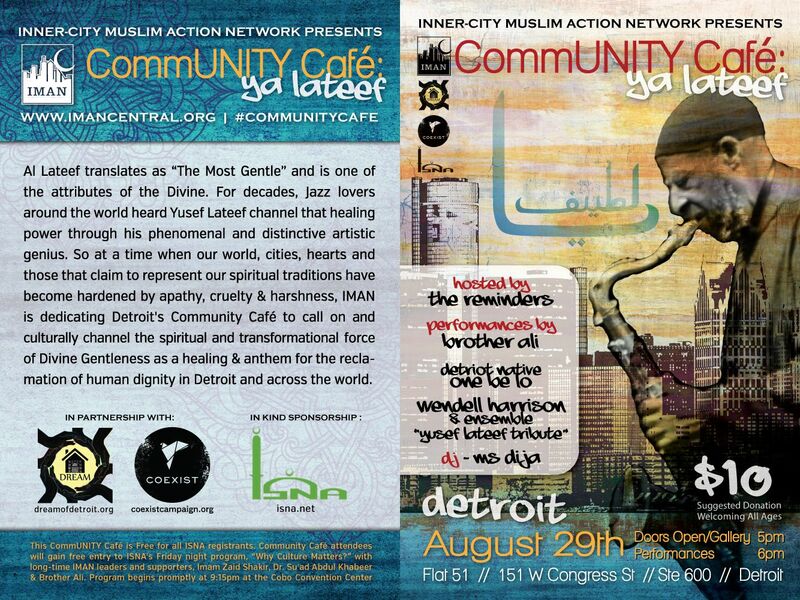 At a time when our world, cities and hearts, and those that claim to represent our spiritual traditions have become hardened by apathy, cruelty and harshness, IMAN is dedicating this CommUNITY Café to call on and culturally channel the spiritual, transformative and healing force of Divine Gentleness as an anthem to the reclamation of human dignity in urban Detroit and across the world. It’s this force that is animating the drive to reclaim and re-imagine inner-city Detroit and other urban neighborhoods across the country, and it’s this force that drives us at IMAN. – Dream of Detroit project: An urban housing initiative inspired, in part, by IMAN’s Green ReEntry. – CoExist Foundation: Coexist is a non-profit organization advancing social cohesion through education and innovation. – Islamic Society of North America (ISNA), whose 51st Convention will be taking place a few-minute walk from Flat 151, the location of the Detroit CommUNITY Café. Those registered for ISNA will not be asked for the $10 admission fee and those attending CommUNITY Café will be given access to ISNA’s key Friday night program that will begin shortly after our program ends. 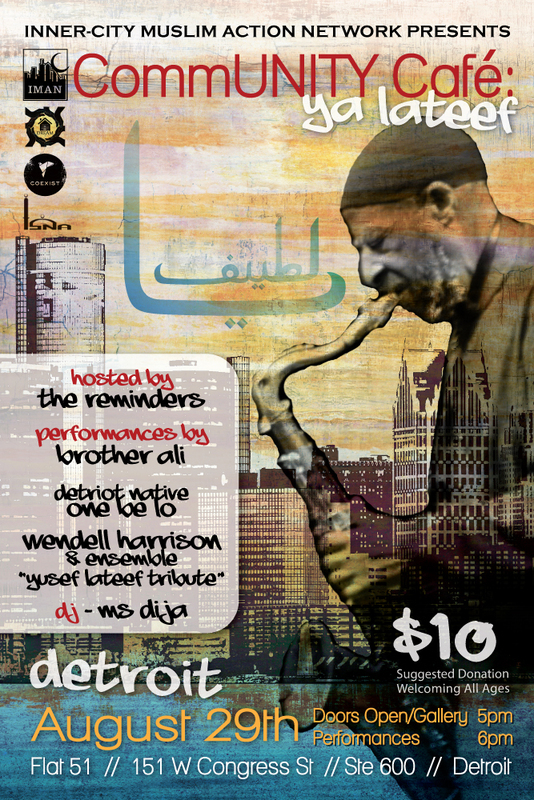 The program will feature performances by Brother Ali, Detroit native One Be Lo and Wendell Harrison & Ensemble among others.